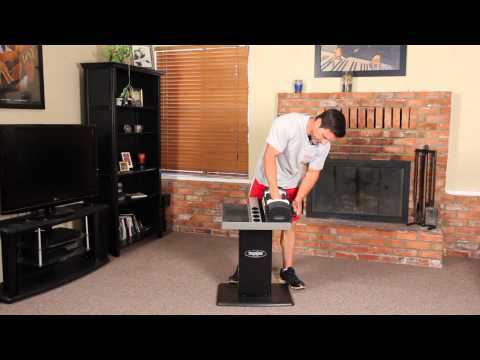 Is the PowerBlock adjustable dumbbell system right for you? If so, which specific model should you choose? 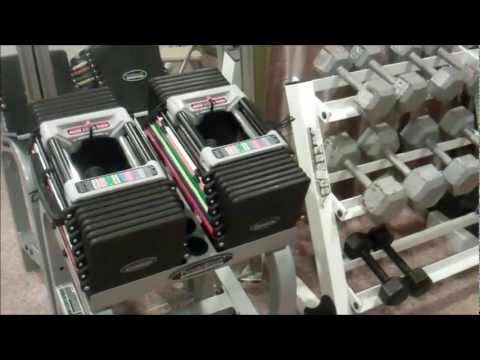 Videos & photos of each different PowerBlock dumbbell set. 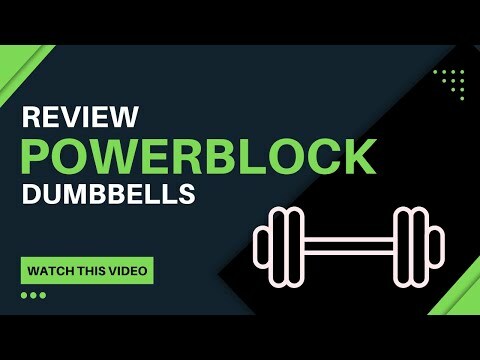 What's the Best PowerBlock Dumbbell Model to Buy? Within each series, there are several different models. I'll go over them in detail later. Some models are expandable, while others are non-expandable. That is, with some models you have the option to purchase add-on kits to increase the maximum weight, while others lack such options. It is quite confusing to distinguish between the various series, models and add-ons, especially when you're just starting to research them. With so many models, each having its own unique set of features, capabilities and limitations, it takes some effort to familiarize yourself with not only the major distinctions between models, but also their more subtle ones. This process of gathering, filtering and analyzing crucial product information takes hours of research and can be frustrating. 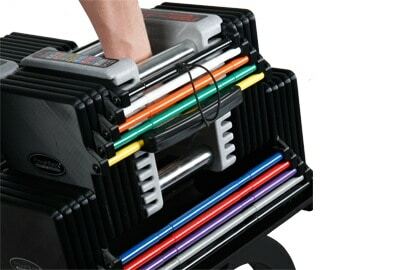 It's the last thing you'd want endure when your aim is to simply buy a set of PowerBlocks and be done with it. However, it would be foolish to make such an expensive investment without first attaining all the knowledge needed to make the correct choice. 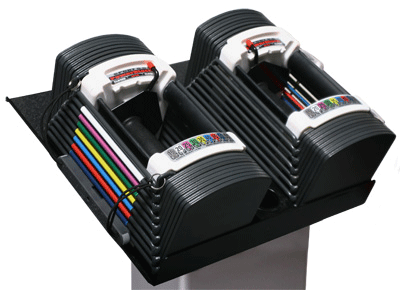 And so, it is my goal to help clear up the confusion surrounding the PowerBlock dumbbells by presenting all the essential information in a coherent fashion. You'll notice that some models in the chart below have different "stages" (i.e. Stage 1, Stage 2, Stage 3). 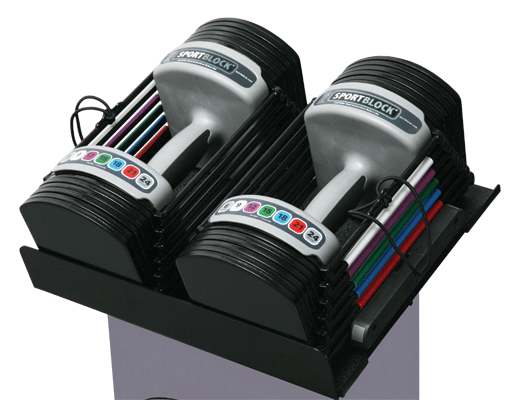 What this means is that you can expand the weight capacity of the base dumbbell set (i.e. the Stage 1 set) with a Stage 2 expansion kit and then a Stage 3 expansion kit. So, you can buy just the Stage I model to begin with, and then purchase the expansion kit(s) separately, some time in the future. 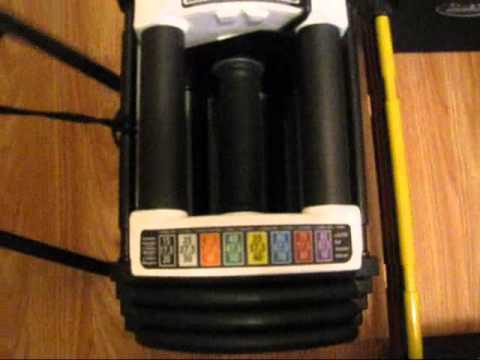 This method is best if you're strapped for cash and/or don't know if you'll even need the extra weight capacity. 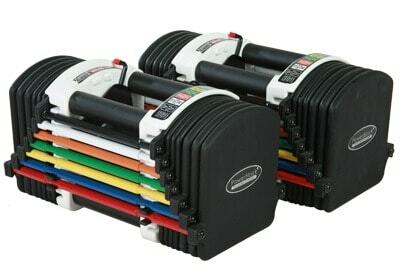 Alternatively, you can buy the dumbbell sets with the expansion kit(s) included. This is what the "Stage 2" and "Stage 3" models in the chart refer to. You save some money this way, as opposed to buying the base set and expansion kits separately. For example: You could buy just the Sports EXP Stage 1 set now, and then have the option to buy the Stage 2 and Stage 3 expansion kits later. Alternatively, you could buy the Sports EXP Stage 2 set now and have the choice to buy the Stage 3 expansion kit later. Or, the third and final option would be to go all out and buy the Sports EXP Stage 3 set now, and have everything included from the get-go. 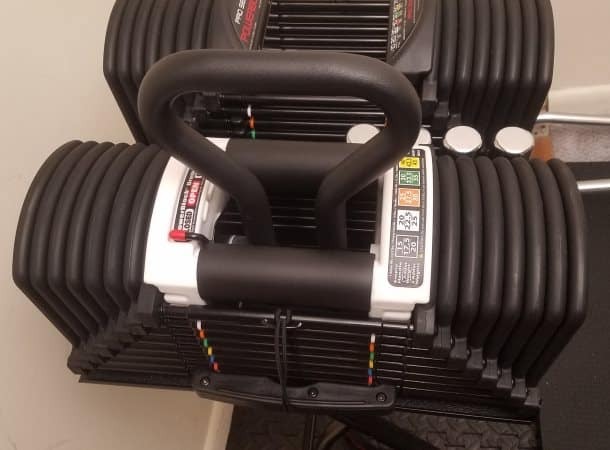 ** The precise weight increments for the "Heavy Weight 125 lb" and the "Heavy Weight 125 lb + 50 lb Add-On" are as follows: 2.5 lb increments from 10-105 lbs (and from 130-175 if using the 50 lb Add-On Kit); 3 lb increments from 105-125 lbs; 2 lb increments from 120-122 lbs. 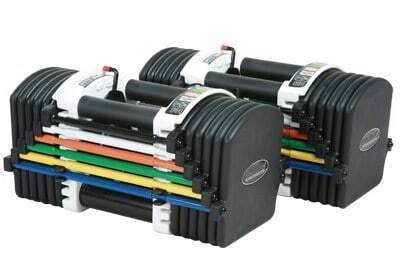 ...But, having done so much in-depth research of the PowerBlock dumbbells, I can confidently tell you which models would be at the top of my list, if I were to choose a pair for myself (or anyone serious about lifting). 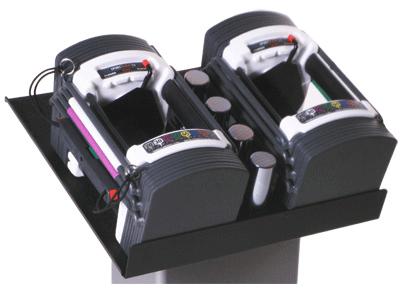 Pro EXP: The Pro EXP Stage 3 set goes up to 90 lbs per dumbbell. Note that you can get the Stage 1 set (5-50 lbs) or Stage 2 set (5-70 lbs) to start; then buy the Stage 2 expansion kit (50-70 lbs) and/or the Stage 3 expansion kit (70-90 lbs) later, if your budget is strict. 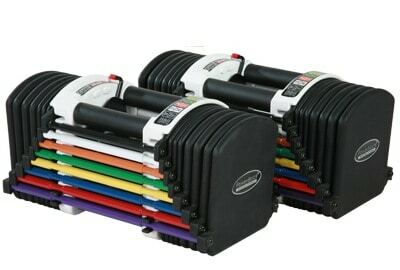 Elite: The Elite 90 comes with 90 lbs max capacity per dumbbell. 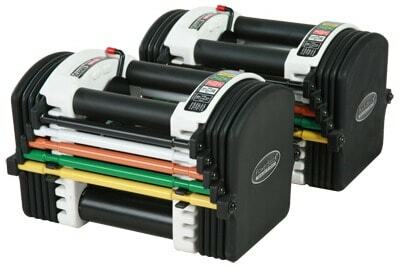 The Elite 50 and Elite 70 are expandable up to 90 lbs with their own expansion kits. 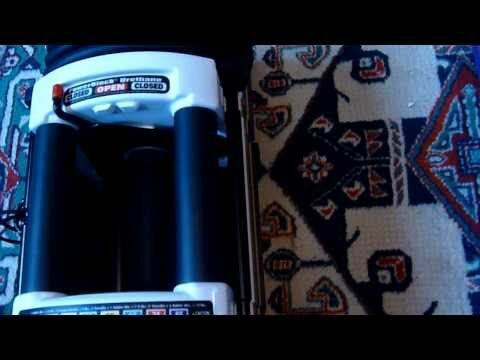 Sport EXP: Goes up to 90 lbs with the Stage 3 set. The Stage 1 set (5-50 lbs) and Stage 2 set (5-70 lbs) can of course be upgraded later to get the full 90 lb capacity by getting the Stage 2 (50-70 lbs) and Stage 3 (70-90 lbs) expansion kits separately. 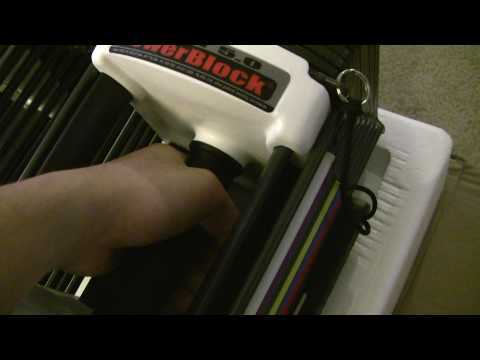 PowerBlock EXP: The PowerBlock EXP Stage 3 set adjusts up to 90 lbs per hand. 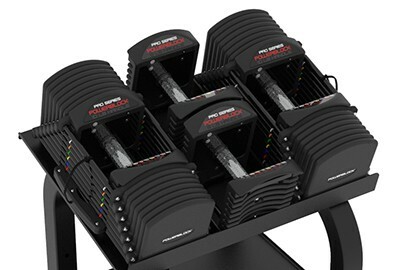 As with all other dumbbells, above, the PowerBlock EXP series has a Stage 1 set (5-50 lbs) as well as a Stage 2 set (5-70 lbs). 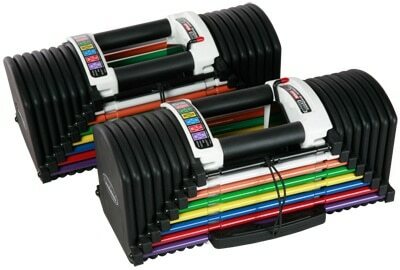 You can expand either of these sets later to reach the 90 lbs max capacity with the Stage 2 expansion kit (50-70 lbs) and the Stage 3 expansion Kit. 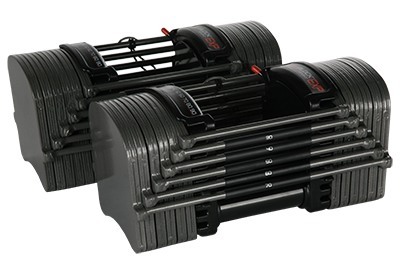 Pro 90 Commercial Set: The Pro 90 Commercial Set comes with 90 lbs max capacity per dumbbell; not expandable. 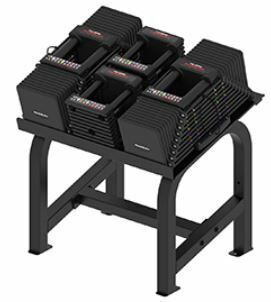 Pro 125 Commercial Set (or Pro 175 Commercial Set): The Pro 125 set is expandable to 175 lbs. with the 125-175 lb expansion kit. 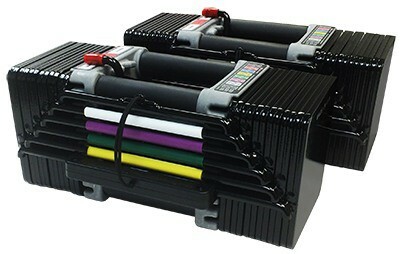 The Pro 175 set is 175 lbs when you get it. They are expandable to 90 lbs. Even very advanced lifters rarely need more than that. If they do, it's only for a small handful of exercises (e.g. one arm rows, dumbbell bench press). 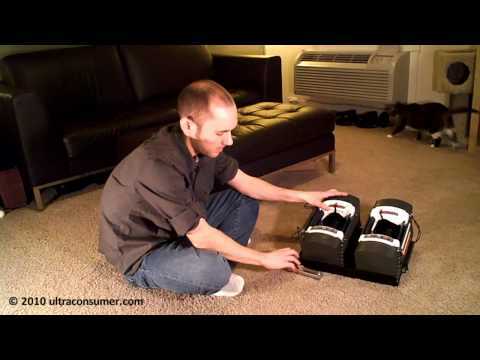 They have a protective Urethane coating over each weight block. This makes a major difference in preventing cosmetic as well as functional damage from short drops. The rails connecting the ends of each block to together use a superior non-welded "flex" design. This allows them to move and bend slightly, as shown above. This makes them them MUCH less likely to be damaged from drops, compared to inflexible welded designs. 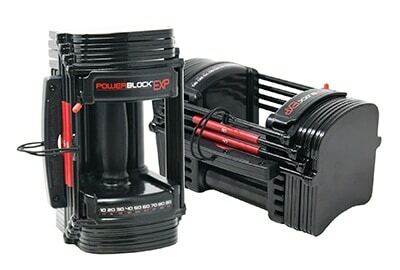 These are the only home-use PowerBlock series that has this flex technology (the Pro Commercial also have it). 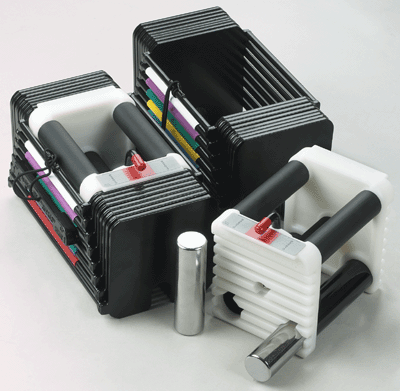 The Classic (Elite), Sports and PowerBlock series' all use a welded design. 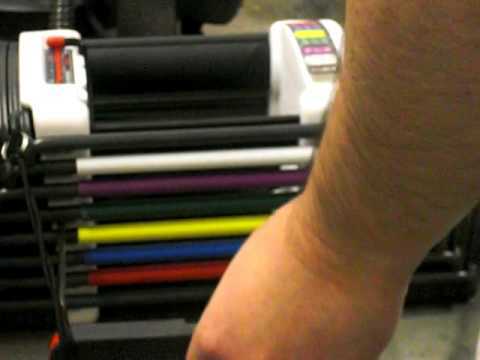 The Pro EXP's flex design combined with its urethane coating, make it unmatched in terms of durability and robustness. They're the only PowerBlock series that's compatible with the KettleBlock handle, giving you access to an adjustable kettlebell option. They're also the only line that's compatible with the PowerBlock EZ Curl / Straight Bar handles which essentially convert the Pro EXP dumbbells into adjustable barbells! They have a 5 year limited warranty, which covers manufacturer defects as well as damage from normal use and drops from as high as 12 inches. 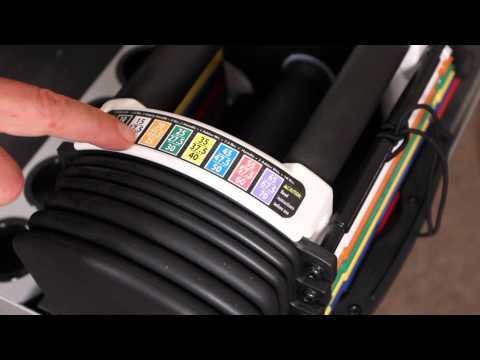 This is the same warranty offered on ALL home-use PowerBlock models. 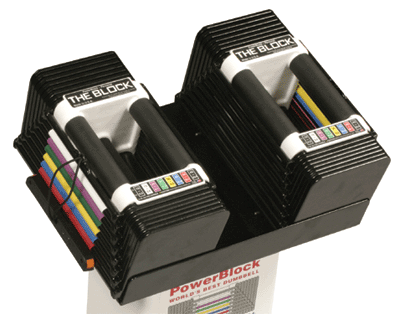 Until recently, PowerBlock had 10 year, 15 year of lifetime warranties on different models. 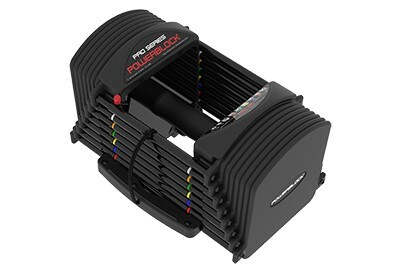 However, after noticing that the PowerBlock EXP warranty was less than this, despite being a better and more expensive dumbbell, I reached out to a PowerBlock rep for clarification (in early Jan. 2019). He told me that all new home-use PowerBlock models sold going forward now have a standard 5 year limited warranty. If you see conflicting information elsewhere, it's out of date. 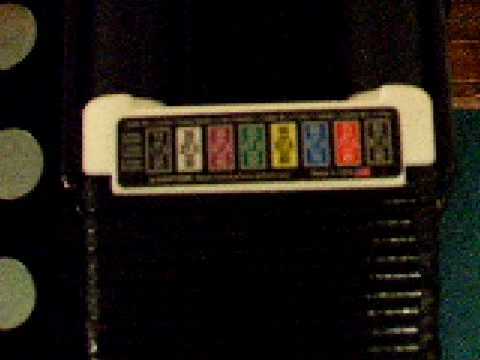 This photo shows just the Pro EXP Stage 1 base set. If you buy this one, you can (and should!) buy the Stage 2 expansion kit & Stage 3 expansion kit later, to get the full 90 lbs max weight. 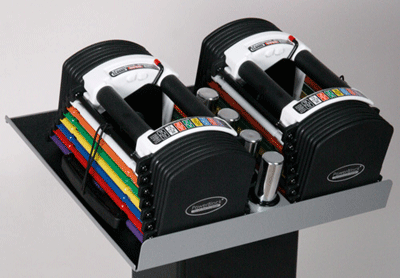 Want to learn more about these dumbbells? 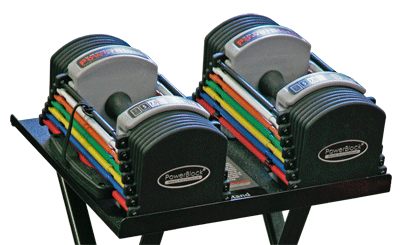 Be sure to read my full review of the PowerBlock Pro EXP dumbbell set. ...And the Pro EXP Stage 3 set is significantly more expensive than the next best models: the Elite 90 and Sports EXP Stage 3. Specifically, the Pro EXP Stage 3 is currently $138 more than the Sports EXP Stage 3 and $208 more than the Elite 90. ...However, if I was forced to choose, I would give the edge to the Elite 90 because it is less expensive and much more popular, with raving reviews to go along with it. There is far less user feedback to be found online for the Sports EXP line, especially since it underwent a recent design overhaul. Each model has its own positives and negatives, described below, which makes choosing between the two such a difficult decision. The Elites are more affordable by about $65. The Sport EXP models, however, have a superior build quality, at least from what I can tell from the looking at it visually. 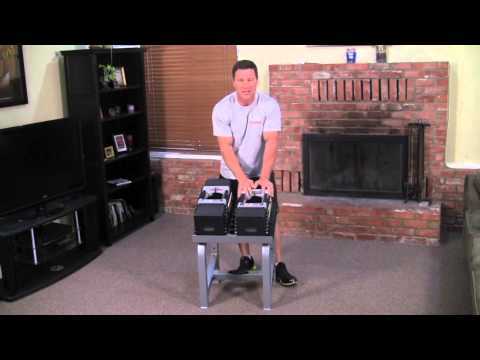 Both sets go up to 90 lbs per dumbbell. This is plenty of weight for the vast majority of lifters on the vast majority of exercises. 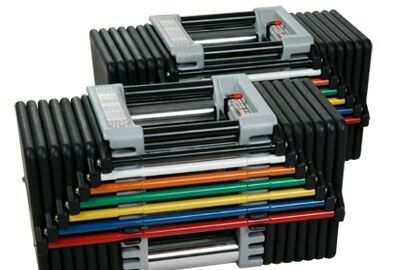 This photo shows just the PowerBlock EXP Stage 1 base set. There is also a Stage 2 expansion kit and Stage 3 expansion kit. Or you can buy the Stage 2 Set or Stage 3 Set right off the bat. 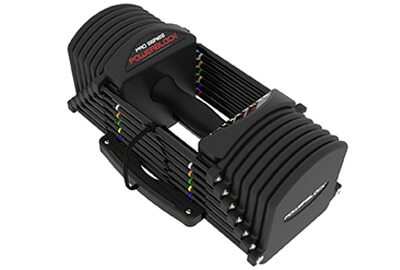 From everything I've seen, the PowerBlock EXP dumbbells are the same as the Sport EXP, from basic design/shape, dimensions, increments, max capacity, and price. The main difference appears to be the color scheme. I've ranked it lower than the Sport EXP simply because it is brand new as of late 2018 when I'm updating this section. It hasn't been out long enough to get any real feedback from customers. Whereas, the Sport EXP has been out for a couple years now, and has received plenty of great feedback. My fifth choice would be the Pro 90 Commercial Set. This is a beefed up version of the Pro EXP Stage 3 dumbbell set (which I ranked #1). It's really made for use in a commercial gym, hence the name. 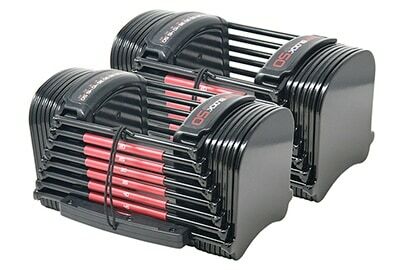 The handles are straight and made of steel with knurling for better grip. 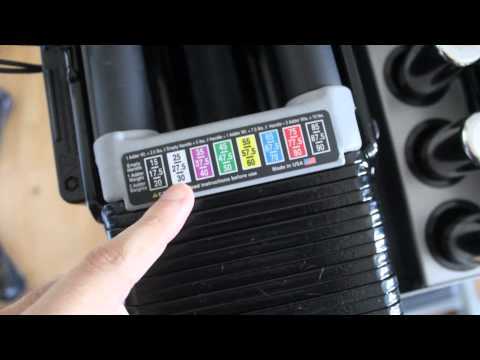 This is a big upgrade from the contoured rubberized plastic grips on the home use PowerBlocks. Whether it's worth the jump in price is a totally different question. 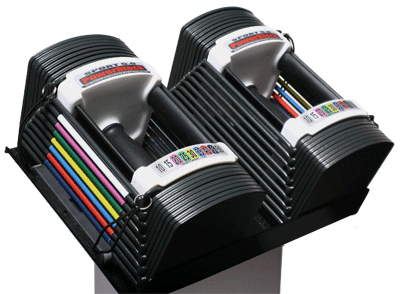 There are two pairs of handles (5 lb & 10 lb) and no adder weights. It's MUCH more expensive. After shipping and handling, it's $594 more than the Pro EXP Stage 3 ($1448 vs $854). 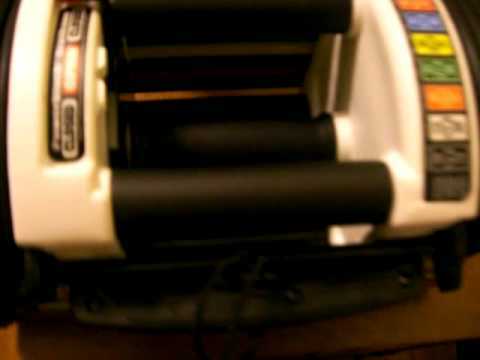 It can't do micro-adjustments of 2.5 lbs since it doesn't have adder weights. 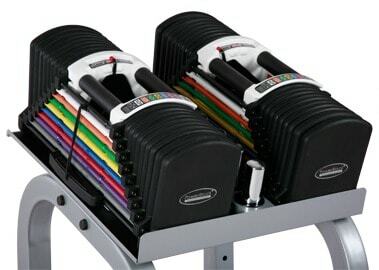 However, it can still do 5 lb increments which is small enough for most exercises most of the time. 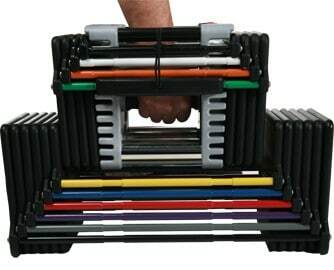 It has the heaviest weight capacity of all the PowerBlock sets. The Pro 125 set is 125 lbs., but is expandable to 175 lbs with an add-on kit. The Pro 175 set comes with the 175 lbs. capacity built-in. It is VERY expensive. 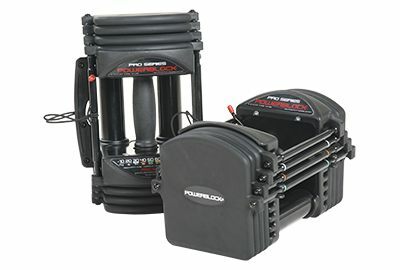 The big price tag is why I put this PowerBlock set as my last recommendation. It will automatically disqualify most potential buyers. BUT, if money isn't a concern, then this is the best set. 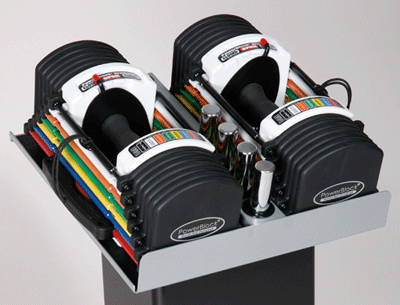 The XXXL 175lb Heavy Weight dumbbell set, which was part of PowerBlock's home use line, has been discontinued. 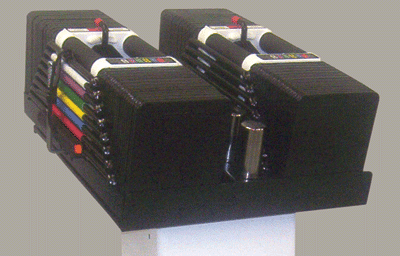 It has been replaced with the U175 club set, which is part of PowerBlock's commercial use equipment line. 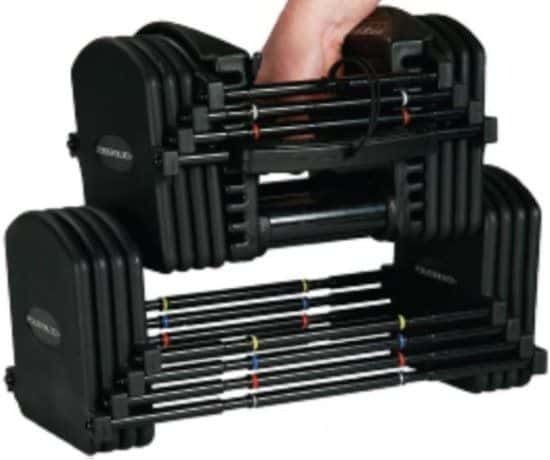 This is essential the same as the XXXL 125lb Heavy Weight set. However, it is now part of the commercial product line. There may or may not be design improvements between the U125 and XXL 125. 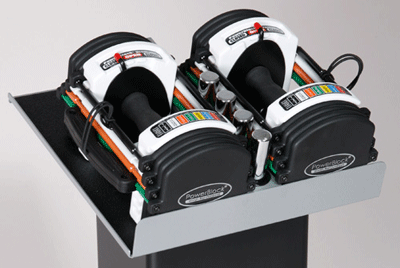 The XXXL 125lb Heavy Weight dumbbell set, which was part of PowerBlock's home use line, has been discontinued. 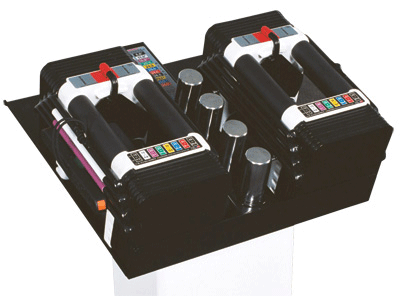 It has been replaced with the U125 club set, which is part of PowerBlock's commercial use equipment line. 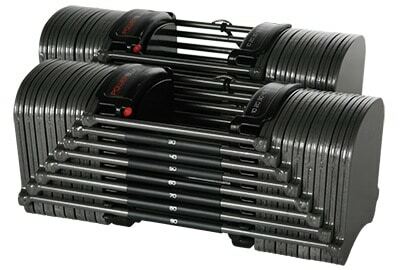 This is essential the same as the XXXL 175lb Heavy Weight set. However, it is now part of the commercial product line. There may or may not be design improvements between the U175 and XXL 175. The only difference between the Sport 24 and 2.4 is the name. The Sport 5.0 (shown directly below) has been replaced by the Sport 50 (shown after the 5.0 photo/video). They are essentially the same, except the old 5.0 is coloful and the new 50 is black. 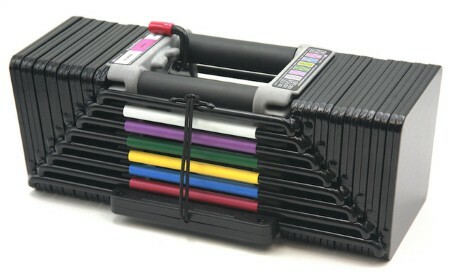 The Sport 9.0 Stage 1 (shown directly below) has been discontinued and replaced by the Sport EXP Stage 1 (shown below, after the 9.0 stage 1 photo/video). The Sport 9.0 Stage 2 (shown directly below) has been discontinued and replaced by the Sport EXP Stage 2 (shown below, after the 9.0 stage 2 photo/video). The Sport 9.0 Stage 3 (shown directly below) has been discontinued and replaced by the Sport EXP Stage 3 (shown below, after the 9.0 stage 3 photo/video). If not, you may have luck searching on Ebay. 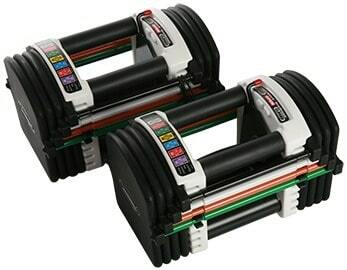 I’m thinking about buying the u90 stage 1 however I’m not sure how they compare to a fixed dumbbell in terms of size, the elite look more compact, thoughts? 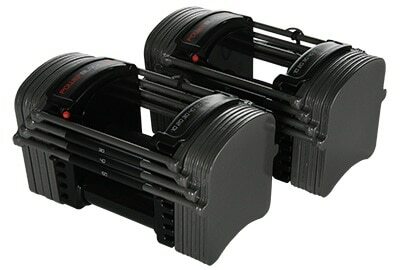 The U90 Stage 1 Set and the Elite 5-50 Set will BOTH be more compact than a fixed dumbbell of the same weight. 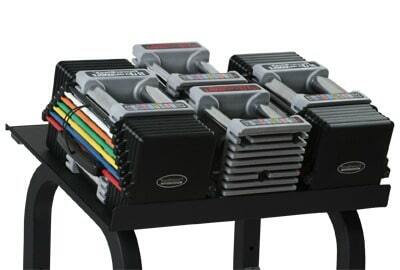 Though it depends on the specific fixed dumbbell and which PowerBlock model we’re comparing, I’d say the difference in length will be 2+ inches shorter on the PowerBlocks, for a given weight. For example, take a look at this 40 lb. 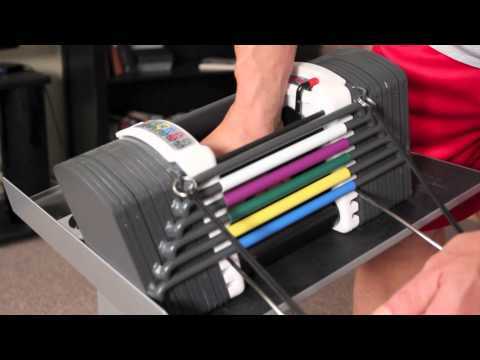 fixed hex dumbbell, it’s 14″ long. 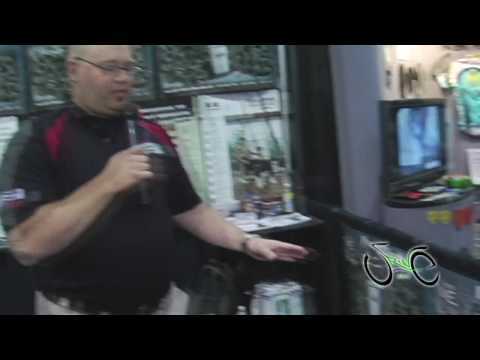 Compare that to the U90 Stage 1 which is 12.5″ long at 50 lbs., and the Elite 5-50 set which is 12″ long at 50 lbs.. 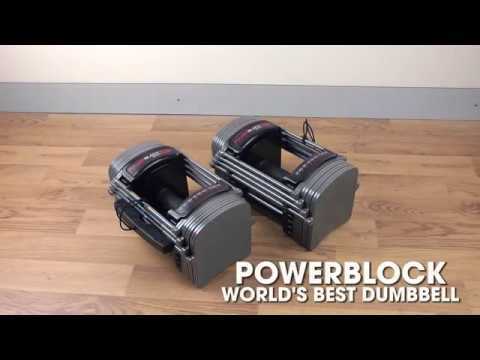 So, both PowerBlock models are 2 or more inches shorter than the fixed dumbbell that’s 10 lbs. lighter. Like you thought, the Elite set is slightly more compact than the U90 set in length, width and height. It’s not a major difference, but it’d be noticeable if you compared them side by side. 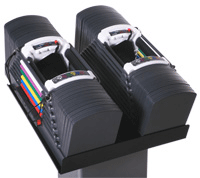 The Elite 5-50 is 12″L x6″ W x 6″ H at 50 lbs, vs. the U90 Stage 1, which is 12.5″ L x 7″ W x 7.25″ H at 50 lbs. 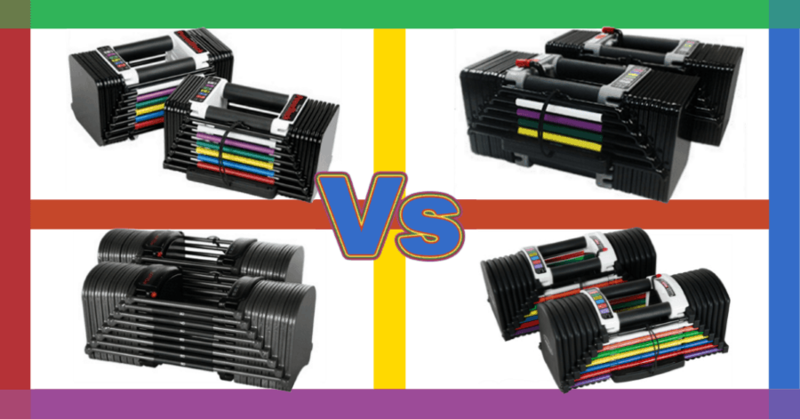 I found this image helpful image that shows a good comparison (the PowerBlock model appears to be the Elite set — all dumbbells shown are 35 lbs). Lastly — if it helps make your decision between the U90 and Elite easier, the U90 is out of stock, and has been for the last couple weeks that I’ve been checking. The Elite is now back in stock after being out of stock for some time a couple weeks ago. Hope that helps, man! Let me know if you have more questions. In your comparison of the pro and commercial version you mention limited lifetime warranty for the pro version. It looks like it is actually only five years — the user manual describes each warranty. The older urethane version has a lifetime warranty. The longest home warranty now is the sport with fifteen years. 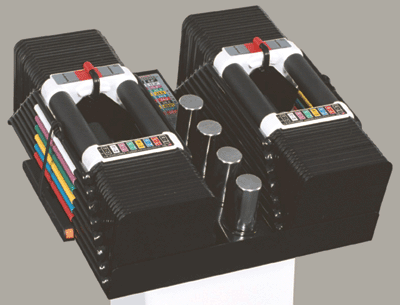 The exp has five years and the powerblock version is for ten years. Kind of strange that the most expensive one has a shorter warranty…. …Anyway, I noticed the same thing as you about the warranty discrepancy. 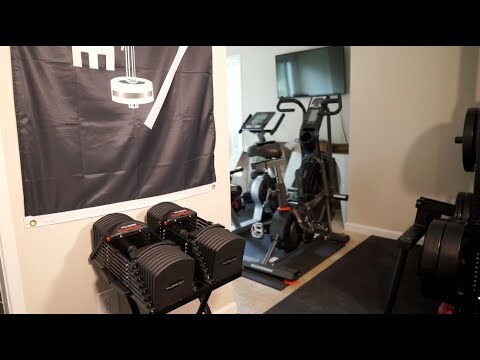 I reached out to PowerBlock a couple days ago to get to the bottom of it and they told me that ALL new home-use PowerBlocks sold now have a 5 year limited warranty — So the Elite/Classic and the Sports are both 5 year warranties now; they’re no longer 10 and 15 year warranties. However, I’m sure if anyone bought one of those units before they implemented this change, they would obviously honor the old warranty. New units sold going forward, though, will definitely be 5 year warranties. 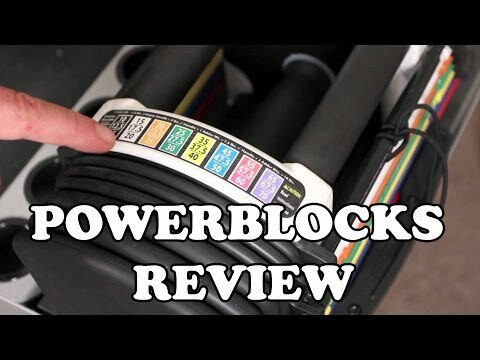 PowerBlock should update the old manuals for the Elite/Classic and Sports Series on their site to reflect the new 5 year warranty term, as it’s obviously a source of confusion. I’m guessing they’ll probably be doing so soon. Hope I cleared everything up for you. Hello Alex. 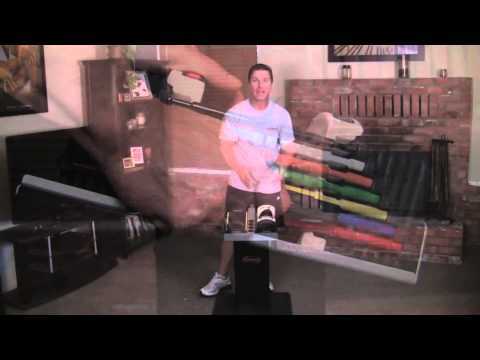 You noted that the Pro EXP is compatible with the kettlebell handle but I can only find the handle for the U series. Can you check this please and let me know if there is a handle for the Pro EXP? FYI, I have more photos in my Pro EXP Review.